This sounded odd to him because he thought Shakyamuni didn’t talk a lot about love in this way. I thought he was right to be suspicious, although to me the thing that stood out was the reference to the whole world being one family. I don’t think the Buddha of the Pali canon would ever have said anything like that. The Hitopadesha is a compilation of fables involving birds and animals, that was translated into English as early as 1787. A later translation by Edwin Arnold, who is well known to Buddhists as the author of “The Light of Asia” (a biography of the Buddha in poetic form), was published in London in 1861 under the title The Book of Good Counsels. To say, This is one of us, or this is a stranger, is the mode of estimating practised by trifling minds. To those of more generous principles, the whole world is but as one family. “The Hitopadeśa story quotes this saying which was already widely known at the time,” says Datta. The Buddha sometimes regarded the family, at least when he was talking to his monks, as an encumbrance, rather than as an ideal to be strived for. He said things like “The household life is confined and dusty, going forth is in the open…” We should remember that he abandoned his own family and named his son “Fetter” (Rahula). When he described families in negative terms, this seemed to be when they acted as an obstruction to those who yearned to become monks or nuns. From an inconstruable beginning comes samsara. A beginning point is not evident, though beings hindered by ignorance and fettered by craving are transmigrating and wandering on. A being who has not been your mother at one time in the past is not easy to find… A being who has not been your father… your brother… your sister… your son… your daughter at one time in the past is not easy to find. The Buddha is certainly making the point here that we are all one family, although his point is mainly to emphasize the immenseness of time over which humans have been reborn and to encourage dispassion. He doesn’t explicitly make the point that we should treat others as if they were family members, but it’s possible that he had that in mind when he picked that image. However, given that the passage ends with a reminder of how painful samsara is and how the immensity of time we’ve been suffering here should lead us to dispassion, it’s more likely that he had in mind the many times we’ve experienced the loss of family members. He’s more likely encouraging his followers to disengage from their affection towards their families. He’s in effect saying something to the effect of, “Look, your current family is just one amongst an infinite number you’ve had over the eons, and you’re going to lose them like you’ve lost the rest, so don’t be too emotionally entangled with them and get on with your practice!” This sutta is in fact one of many detailing the many pleasurable and painful things that have happened to us in samsara; each one ends with encouraging dispassion. Nevertheless, Buddhism does encourage us to be kind to everyone, not just those we’re biologically related to. 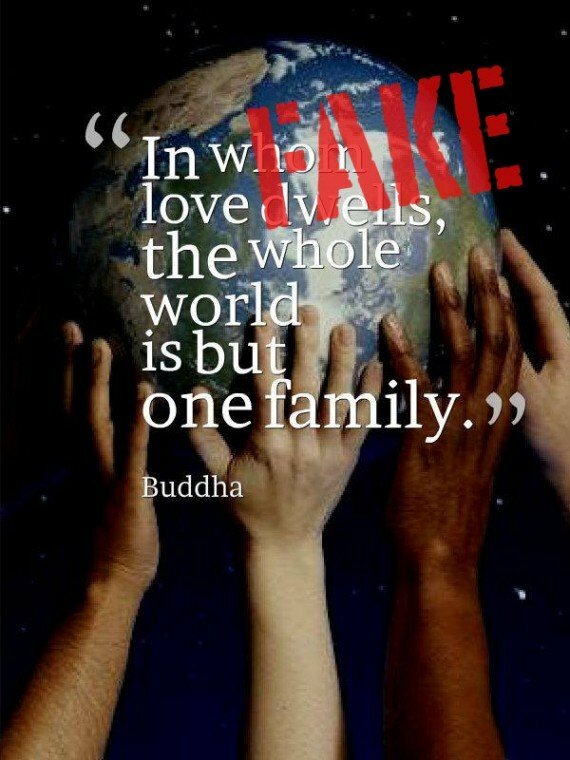 And so as with many Fake Buddha Quotes, “To those in whom love dwells, the whole world is but one family” is very much in line with Buddhist principles. It’s just not, as far as we know, something the Buddha happens to have said. The Hitopadeśa story quotes this saying which was already widely known at the time. Good to see you researched so much to prove that Buddha did not say this or did not mean it. Dear brother, research person or intelligent person like you should think about or spend his time/resources/energy for that real one world, one family ( Vasudhaiv Kutumbakam ). You very well understand that only thinking mind like you can do this. Dear Brother! Let’s do it!! Let’s work to make this world better place so each one can live good life. Let’s put our efforts to create that real One World Family!